Beautiful fall day here today, perfect weather for a round of mini golf and a harrowing half hour lost in a man made maze with an intrepid 8 year old. I felt like I was in the last scenes of The Shining. I cast on this lovely chapeau with the Quince Chickadee I bought earlier in the month. 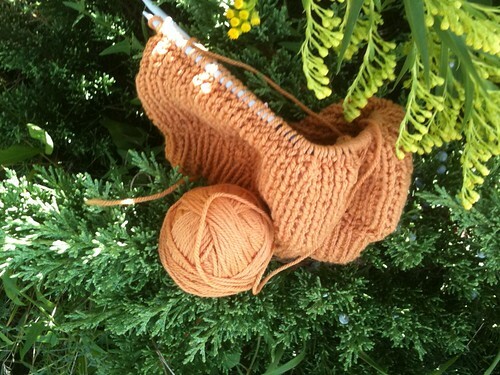 This yarn has a great hand, all boing and spring. And it even has sass! At $5.40 a skein it’s also a steal. While I find it hard to believe the summer is over blah blah blah, I am intensely happy that Sheep and Wool Festival season is right around the corner. I decided I am going to give most of my current stash away to my daughter’s yarn club and buy all new. I like the yarn – what a great color – perfect for the season! Great idea for the stash – nothing like starting over fresh ;-). Are you going to the NJ Sheep & Wool? Wow, that’s an interesting idea… I have such *feelings* about my stash! Some good, some good turned sour. Knitting A Mile Square is powered by	WordPress 5.1.1 and delivered to you in 0.235 seconds using 38 queries.